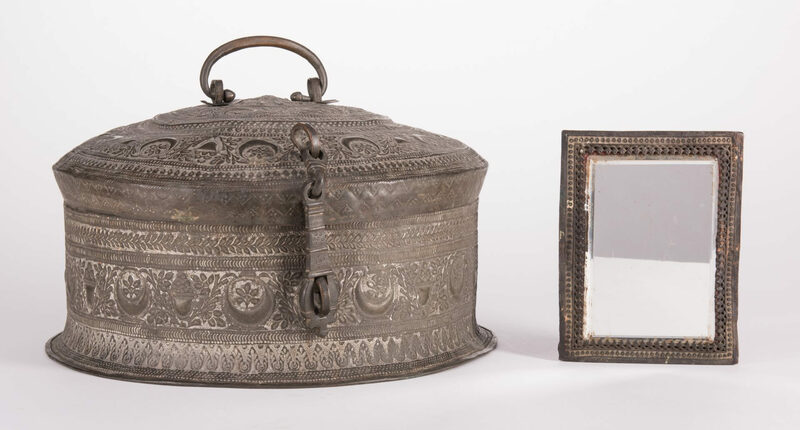 Grouping of Indian and Near Eastern items, 13 items total. 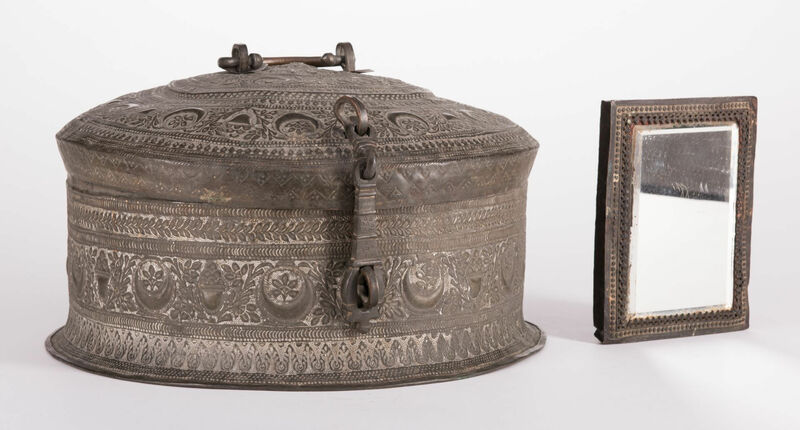 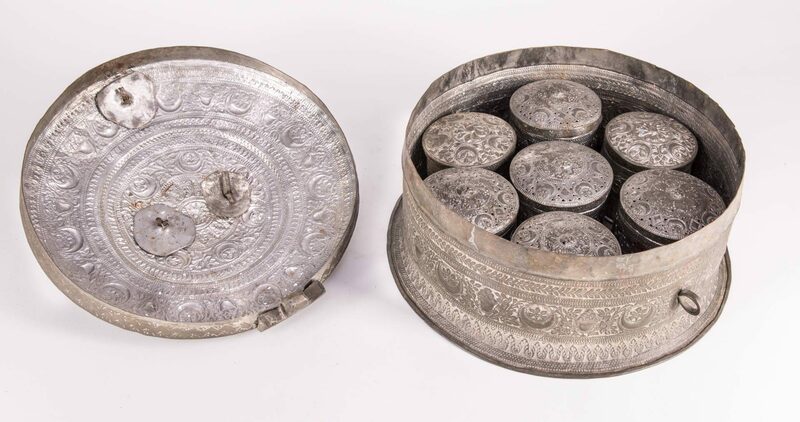 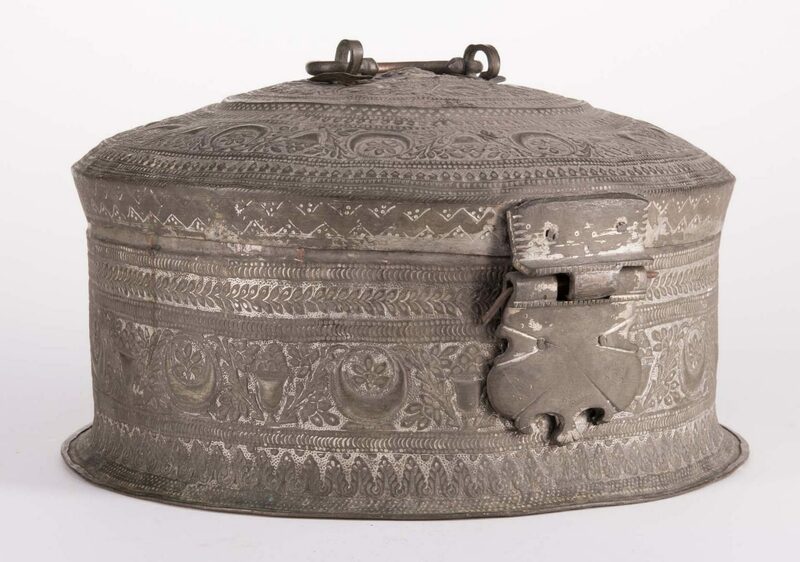 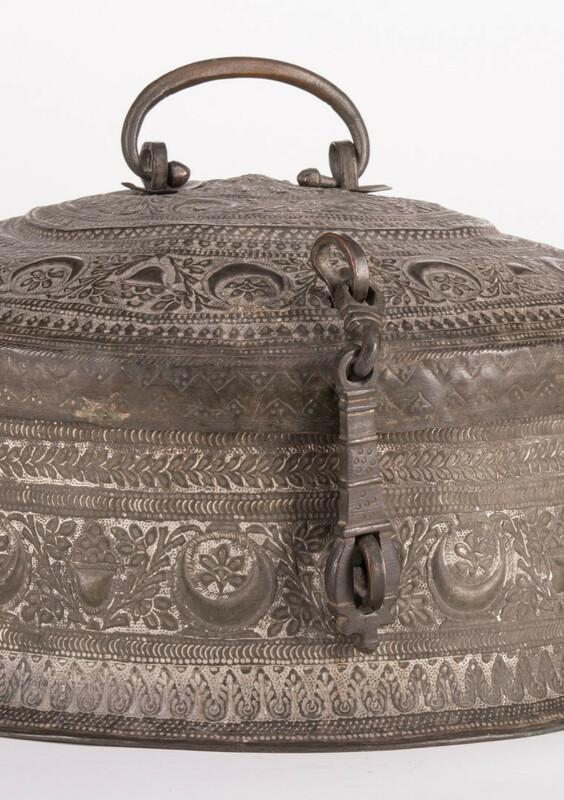 1st item: Late Mughal style Indian tinned copper Pandan box with fitted interior containers including one (1) round dish and five (5) small pots for spices or herbs. 9 3/4" H x 17 1/2" dia. 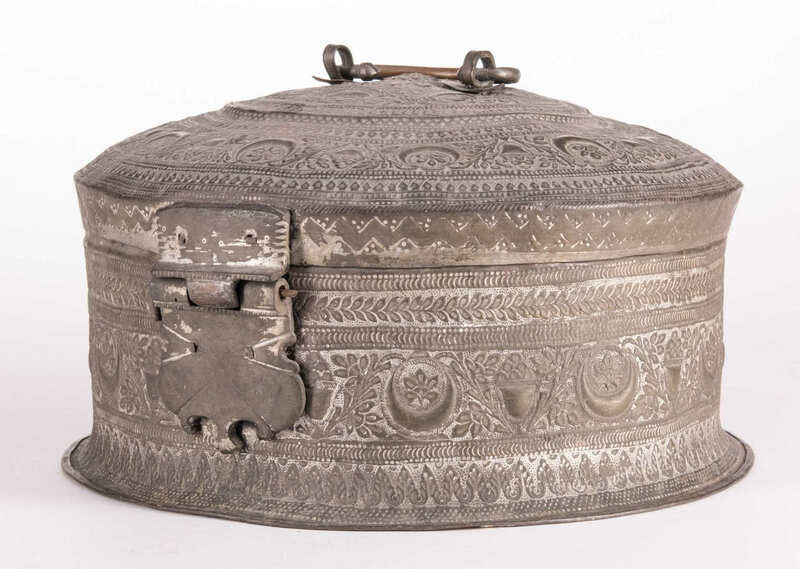 Mid-late 19th century. 7 total pieces in 1st item. 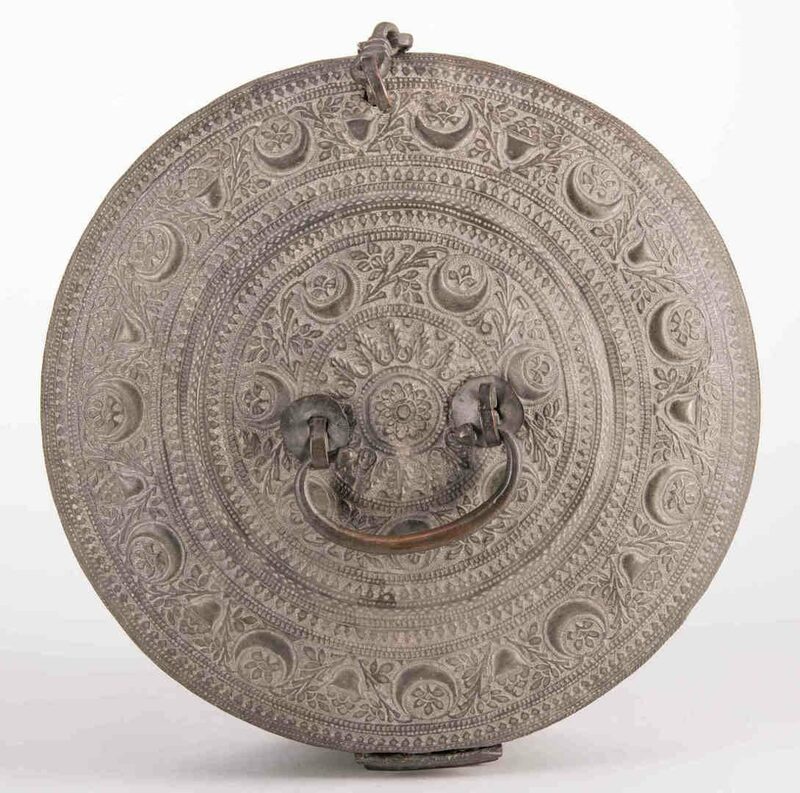 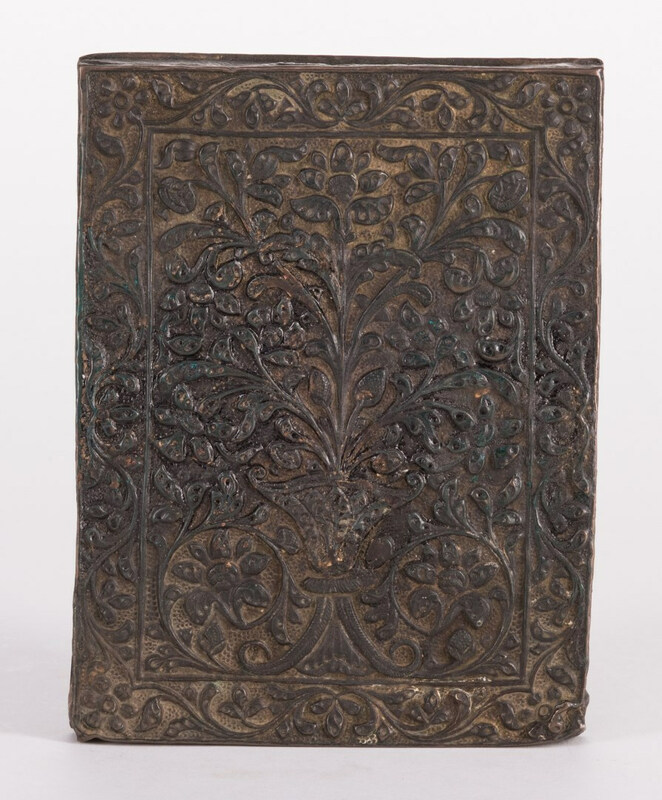 2nd item: Persian bronze mirror with "Tree of Life" design. 8 1/4" H x 6 3/8" W. 22.8 lbs. 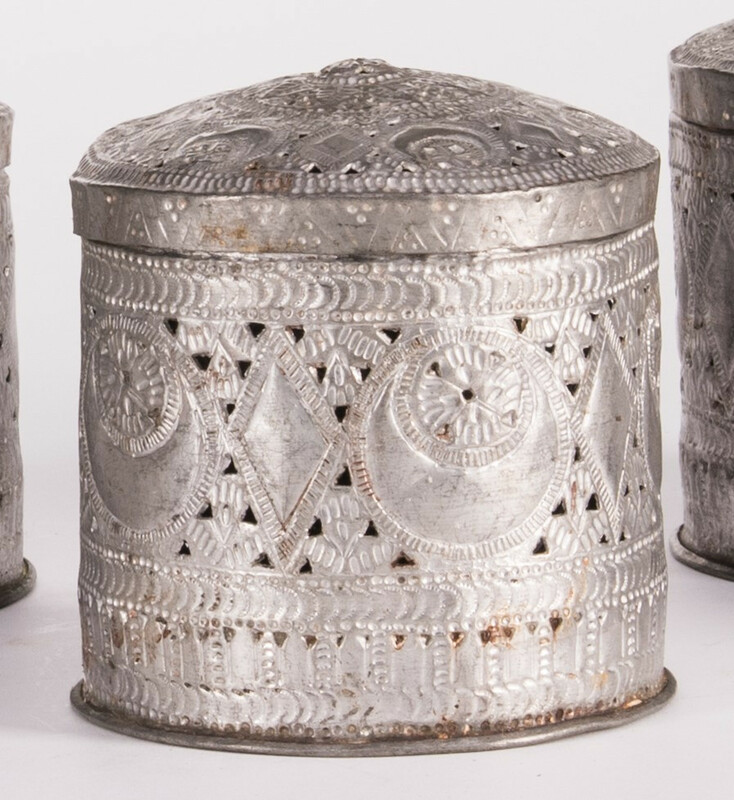 3rd-7th items: Five (5) Near Eastern Metal Containers including two (2) Persian copper repousee round covered boxes with finials (4 1/4" H x 4 3/4" dia.) 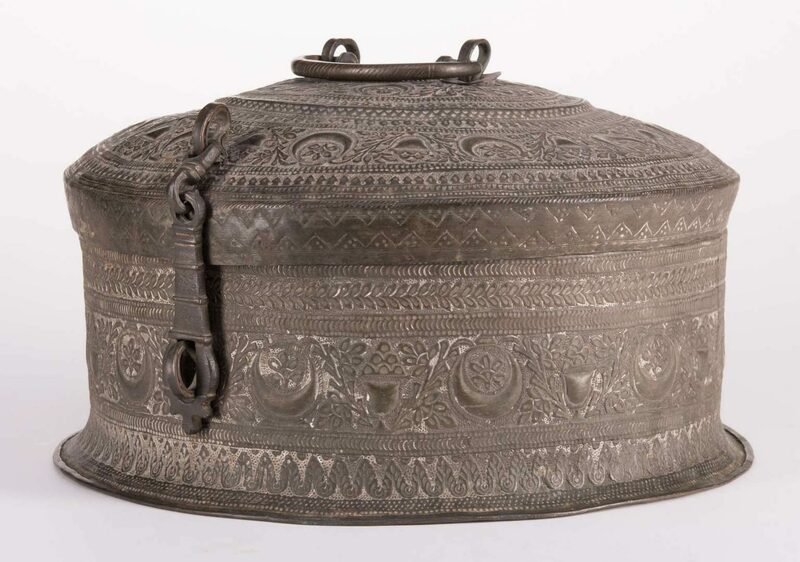 one (1) Persian or Nepalise gilt bronze low bowl with engraved decoration to interior and exterior of bowl (3 1/4" H x 10 1/2" dia. 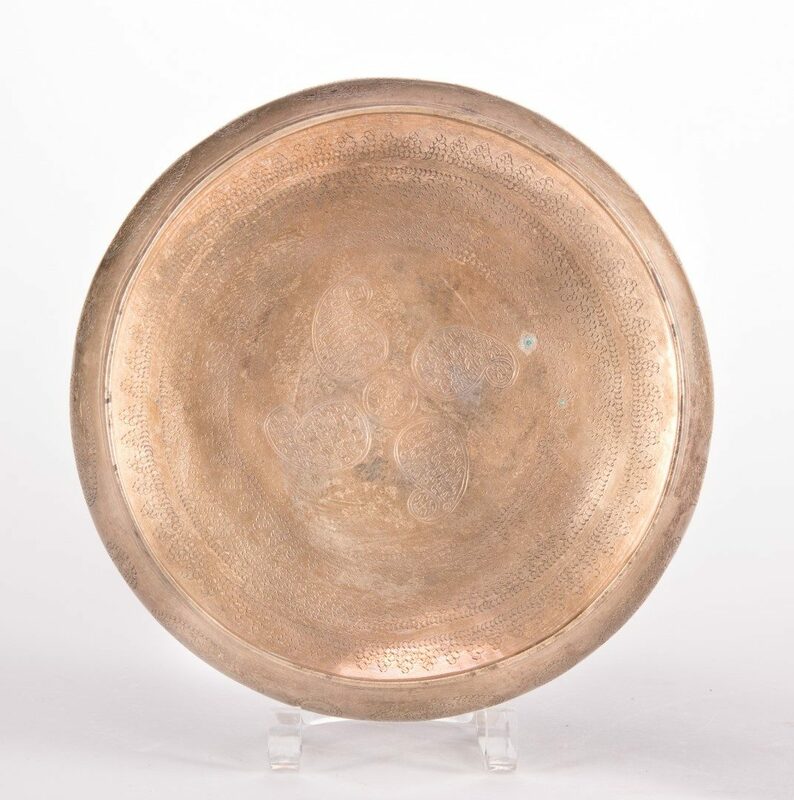 ), one (1) Near Eastern gilt copper bowl with relief decoration including various animals to the exterior (3 3/4" H x 6" dia.) 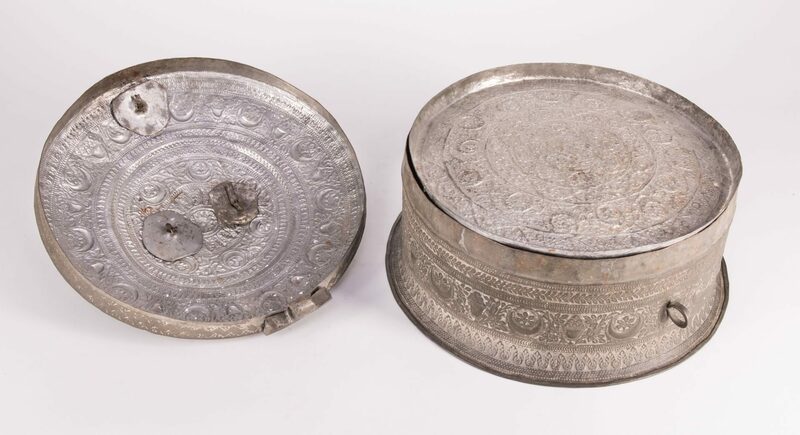 and one (1) Near Eastern copper and tin round lidded covered box with allover engraved decoration (4 1/2" H x 7 1/4" dia.). 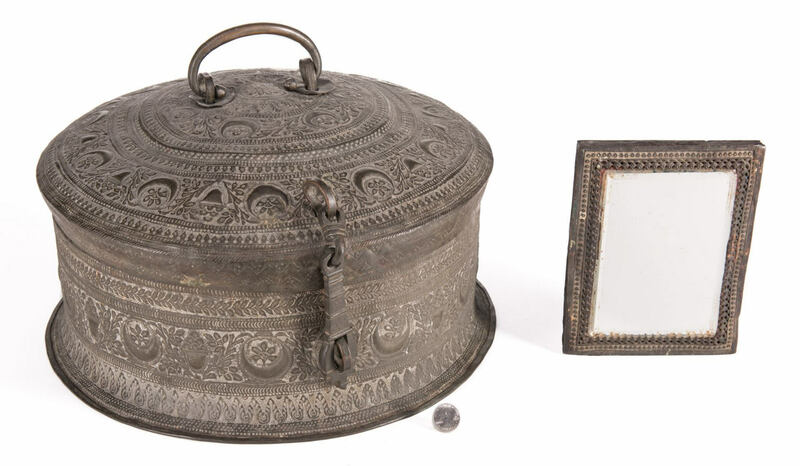 All items Late 19th/early 20th century. 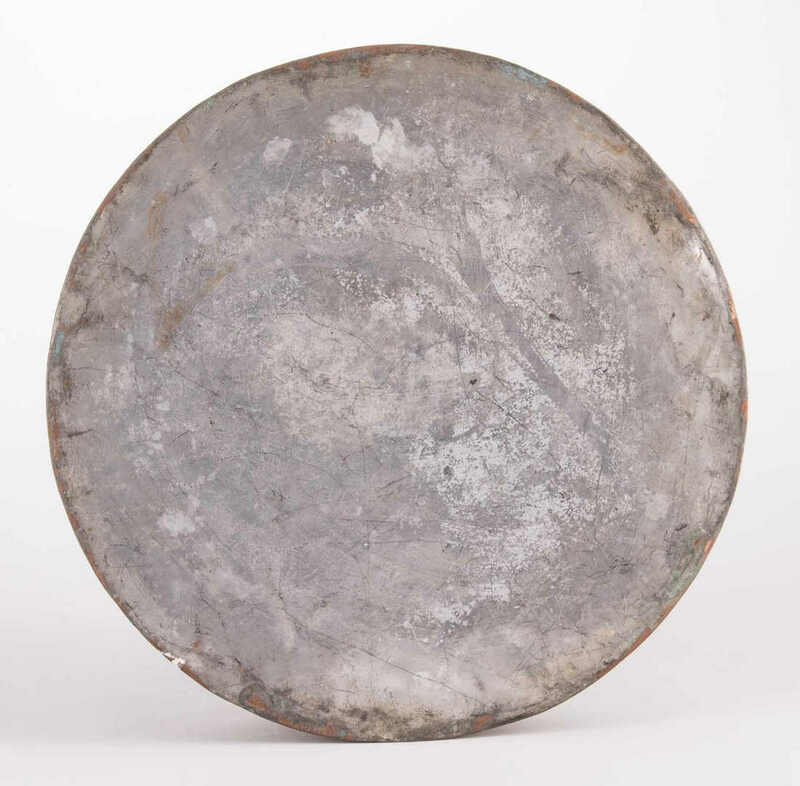 Provenance: Private Maryville, TN estate. 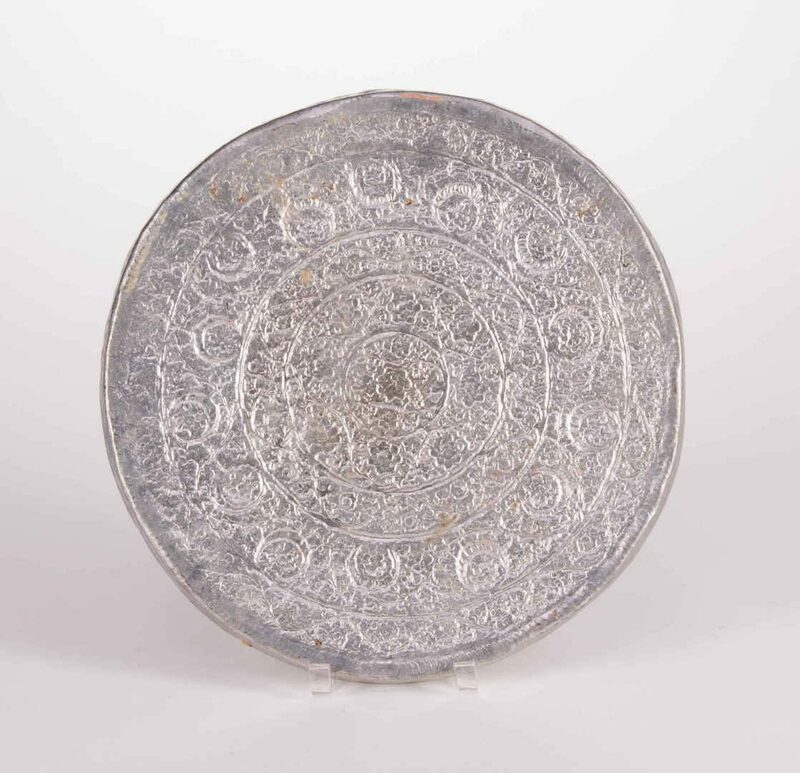 CONDITION: 1st item: Some denting to top, overall very good condition. 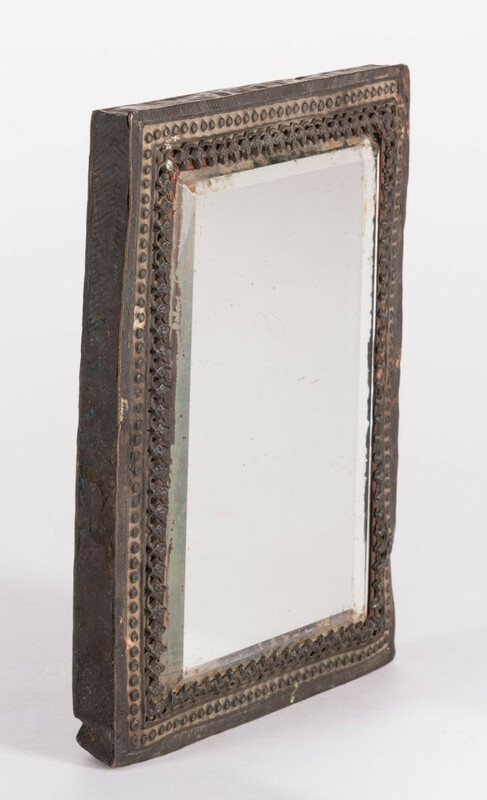 2nd item: Mirror likely not original. Denting to both bottom corners. 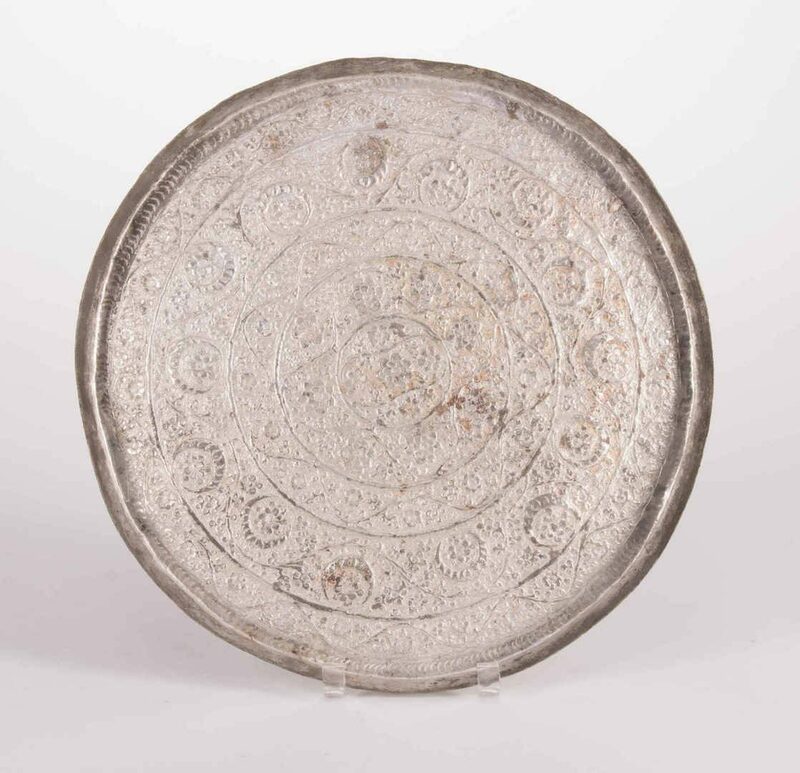 3rd-7th items: All items overall good condition with general wear, some mild oxidation.